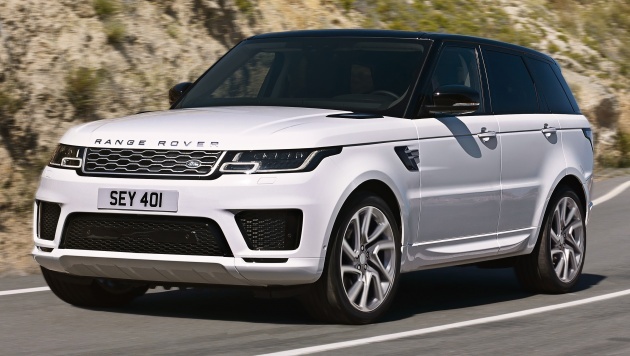 The Range Rover Velar may be the star of Land Rover’s stable at the moment, but Solihull hasn’t forgotten about its original sporty SUV, the Range Rover Sport. The second-generation L320 has received a facelift that brings refreshed looks, new technologies and a new plug-in hybrid variant – a Land Rover first. Let’s start with the aesthetic changes, which appear to have been inspired by the Velar. The headlights are now more angular and are available with Pixel-laser LED technology with 144 individual LEDs and four laser diodes, each capable of turning off individually to avoid dazzling oncoming traffic. The new chain-like grille design has also been taken off the Velar, while the air intakes have been made larger and more aggressive. Moving on, the side fender vents have been redesigned, and the rear features new LED tail lights, a slotted tailgate spoiler to reduce dirt accumulation on the rear windscreen and a revised lower valence with integrated tailpipes. There are three new 21- and 22-inch wheel designs available, plus an optional carbon fibre pack that adds the material on the grille, vents, door mirror caps and tailgate finisher. 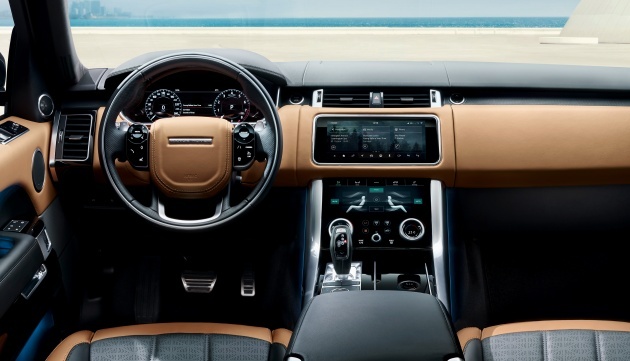 Inside, the Velar’s Touch Pro Duo system has found its way here, incorporating twin high-definition touchscreens – one for infotainment, the other for configure the climate control, seat and vehicle settings in conjunction with twin rotary Dynamic Dials. The smaller model’s customisable steering wheel controls have also been fitted, as has a new 12-inch instrument display and a 10-inch head-up display. Other new features include a quicker voice control system with English and Mandarin recognition, twin rear touchscreen displays, gesture control for the roof sunblind, Nanoe air purification technology, a new centre console fridge and no less than 14 connection points around the cabin – these include USB, HDMI and 12 V ports, plus twin domestic plug sockets for charging laptops and other devices. 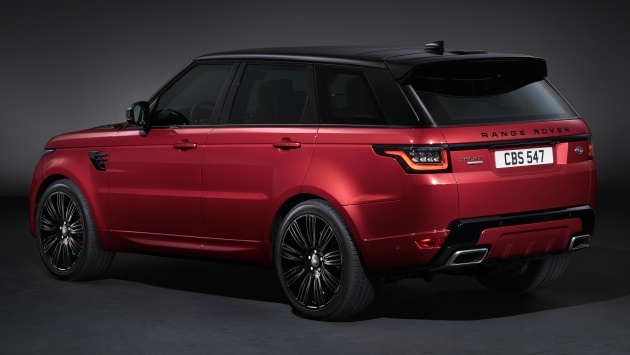 The new Range Rover Sport also adds a couple of new items from other models in the Jaguar Land Rover stable, including semi-aniline leather from the full-fat Range Rover and the Jaguar F-Pace’s Activity Key, which allows you to lock your actual key in the car when you’re out and about. An Advanced Tow Assist takes care of countersteering manoeuvres while reversing, enabling the driver to simply select the preferred path. Safety features have been restructured for 2018, with autonomous emergency braking and lane departure warning now fitted as standard across the range. The Drive Pack adds a blind spot monitor, driver condition monitor and traffic sign recognition, while the Drive Pro Pack throws in high-speed emergency braking, blind spot assist, lane keep assist and adaptive cruise control with queue assist. Meanwhile, the Park Pack bundles in a 360-degree parking camera, rear traffic monitor and a Clear Exit Monitor that alerts passengers if they’re about to open the rear doors into traffic. The Park Pro Pack introduces Park Assist automated parallel and perpendicular parking. The engine lineup has been revised, headlined by the P400e plug-in hybrid model that replaces the SDV6 Hybrid Diesel. This combines a 300 PS/400 Nm 2.0 litre turbocharged Ingenium four-cylinder petrol engine and an 85 kW (116 PS) electric motor integrated into the ZF eight-speed automatic transmission, resulting in a total system output of 404 PS and 640 Nm of torque. All that propels the massive SUV from zero to 100 km/h in 6.7 seconds before hitting a top speed of 220 km/h. A 13.1 kWh lithium-ion battery under the boot floor provides an all-electric range of 51 km, and the vehicle is capable of driving in EV-only mode as speeds of up to 137 km/h. As with most PHEVs, the P400e can be driven either in Parallel Hybrid or EV mode, with the former featuring an energy-reserving Save function, as well as Predictive Energy Optimisation that uses the navigation system to optimise battery energy usage. Plug it up through a port hidden in the front grille and it will be fully charged in 7 hours 30 minutes via a domestic socket, or 2 hours 45 minutes using a 32 A charge point. Elsewhere in the range, the 300 PS Ingenium petrol engine is available on its own in the Si4 variant, joining the 240 PS/500 Nm Ingenium turbodiesel in the SD4. Going further up the range, the 340 PS/450 Nm 3.0 litre supercharged petrol V6 is now available in a higher-output 380 PS version, while the 3.0 litre turbodiesel V6 continues to be available in 258 PS/600 Nm TDV6 and 306 PS/700 Nm SDV6 guises. Meanwhile, the SDV8 4.4 litre V8 diesel is unchanged and continues to produce 339 PS and 740 Nm, but the 5.0 litre supercharged petrol V8 gets an extra 15 metric horses to put outputs at 525 PS and 625 Nm. Lastly, the high-performance SVR is boosted to 575 PS and 700 Nm – increases of 25 PS and 20 Nm respectively – also gains a new carbon fibre bonnet and Supersport seats to reduce weight, the latter by as much as 30 kg. Of course, the Range Rover Sport still needs to have Land Rover-worthy off-road capability, and its abilities have been sharpened this year, particularly for the P400e. On the PHEV, the Terrain Response 2 system has been retuned to take advantage of the electric motor’s zero creep speed and maximum torque from zero rpm, providing greater control during low-speed off-road manoeuvres. The P400e’s wading depth is the same as other RRS models at 850 mm, despite the electrified powertrain – although Land Rover recommends the petrol engine to be engaged to avoid the ingress of water through the exhaust system. All models benefit from a new Low Traction Launch System derived from Jaguar, which uses a unique throttle map to help drivers pull away on slippery surfaces such as grass, gravel and snow. Where is Proton and Perodua plug in hybrid? Engineers have done their part, already have working EV. ball is in management side. Range Rovers become hybrid. So it’s no longer a luxury work horse but a luxury lifestyle SUV. Times has changed. Range Rovers those days goes into rough terrains. Today it’s a Californian Hollywood star lifestyle SUV or some mak Datin school run vehicle. I still remember drooling over the armoured Range Rovers of London Metropolitan Police SO19 Specialist Armed Unit. Range Rover is owned by INDIA TATA group. Same as volvo is owned China Geely group. Technically ,there is some similarity between xc90 PHEV and P400e. At least both of these brands are getting better and better as each day passes technically and styling since leaving FORD Dearborn incompetent managements, accountants, designers and engineers . It seems any of these brands Range Rover , Jaguar or volvo make during FORD days are either horrible or not reliable at all.